Compass Bearing Course – H.I.C.O.P. We have a compass bearing course at the north end of Confederation field along the tree line. 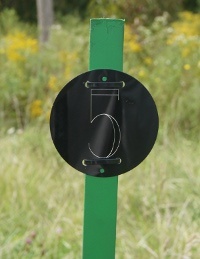 There are five posts 10 metres apart each with a numbered disc attached. Participants will be given a set of 5 cards. Each card has 5 distances and 5 corresponding compass bearings (i.e. a bearing of 195 degrees for 15 metres). The bearings start at a post and end at a different post. The five cards all start at different posts and participants mark on the card what post they ended at and then select the card that starts at that post to continue on. Participants may start at any post but starting at number 1 means that it starts easy and gets more difficult as they go. Pacing off the distance between two posts will indicate how many paces it takes for ten metres. We currently have five sets of cards and five compasses but they are all the same mapped out course. This is a beginner course and ignores declination. As time permits we will map out more courses and create new sets of cards. . If your group is adept they may want to map out a course themselves. You can always ask for our help at the HICOP.